Welcome to Hitt'n the Beach! 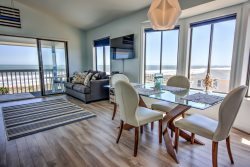 A spacious 3 bedroom 2 bath first floor condo with a great ocean view. Directly across the street is the beach access (a one minute walk) and the community pool. We just completed a remodel including hardwood floors and paint - you'll love the way it looks. We have a large open floor plan with the kitchen, living and dining rooms where everyone can gather and enjoy their vacation time. The deck off the dining room has a great ocean view, sit out and enjoy a cold drink on a warm summer afternoon. All of the bedrooms and the living room have flat screen TV's and we have WiFi and a DVD player. We have parking for 3 cars, one covered, and a locked storage closet in the carport for all your beach gear and bikes. We are a little island but with lots of fun things to do: the NC Aquarium, Fort Fisher Civil War museum, two boardwalks, two fishing piers, Britts Donuts (an institution since 1939), Squiglie's Ice Cram Shop, and Freeman Park - where you can drive out and camp right on the beach. We offer free live bands, carnival rides, and fireworks during the summer and of course have some delicious seafood restaurants. What more could you want! You can book your reservation right from our website or if you prefer, give us a call and we'll be glad to help make your vacation a special one. It has been a pleasure working with David Paul from A1 Property Management. When he realized the condo we had originally reserved was not going to be ready due to the storm he relocated us in a very nice comparable condo up the beach that more than met our expectations. We will definitely use you guys again in the future. The property was very clean and spacious and met all the needs of our family for a short but fantastic fall vacation. Everyone was so nice and easy to work with. From the very beginning we knew right away that we could rent the place and how much and how to pay. It was such an easy process. Excellent, everyone was so helpful. Hitt-n-the Beach was a great place. Very clean,bright and fully equipped. David and team are so nice and make booking a reservation incredibly easy. Right across from the beach access, nicely decorated, the kids loved the bunk beds!